Certification courses are offered to students, faculty/staff, and community members and are conducted by American Red Cross certified instructors. Basic First Aid teaches participants the knowledge and skills necessary to give basic first aid care in an emergency situation and help sustain life and minimize the consequences of injury or sudden illness. The CPR with AED for the Professional Rescuer teaches participants to respond to breathing and cardiac emergencies in adults, children, and infants; use an AED on an adult or child victim of cardiac arrest; and use personal protective equipment to stop bloodborne pathogens and other diseases from spreading. 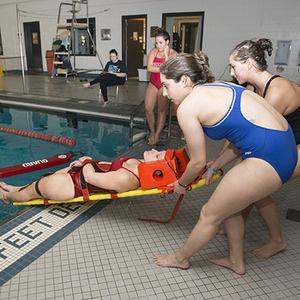 Visit website (https://www.bgsu.edu/recwell/aquatics/certifications-training.html) for the cost. Register Online with RecTrac (use this link: https://rectrac.bgsu.edu/wbwsc/webtrac.wsc/wbsearch.html?wbsi=si&xxmod=AR&xxcategory=HS).